Starting up your own creative business can be pants! | The Decor Cafe | Interiors. Gardens. Lifestyle. Home business. 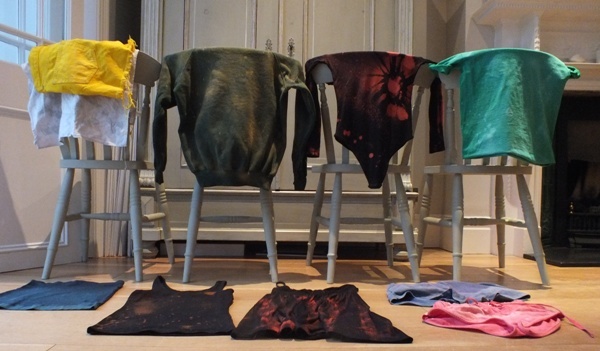 I came home last weekend to discover my daughters and a friend deep in fabric dye in the kitchen, up-cycling their clothes to sell on ebay to save money for various projects. I loved that! But if you are starting-up a business, creative or not, what are the secrets of success? Here are my 10 tips. What do you think? Be clear about how you can add value. It may be the creative way you add colours to your old shorts or it may be something less tangible, like the knowledge or experience you have to share, but to make a profit you have to create value for your customers. Not everyone is going to like what you are doing (a truth I still find hard to deal with!) so make sure that you know who you are going to appeal to, where you are going to find them and how you are going to make them notice you. I think it helps if you love them also. This can be tricky. It is easy to see the qualities in other people and what they are doing but difficult to see them in yourself. But if you aren’t confident in your abilities how can you expect other people to be? The term “authentic” is used so much it is beginning to get irritating, but if you are starting a business you are going to have to give it your all and so you need to be true to yourself and love what you do. We rarely see the value in ourselves because we are so familiar with it – but that is where the opportunity lies. This was one of the best pieces of advice I was given. Don’t get bogged down in a complicated business plan. If you start by drawing a picture of how it will be in a few years time it makes it easier to work out how to get there. If you found it easy to get your business up and running and just took it in your stride I would love to hear from you! In my personal experience it is really hard starting a business.There is masses that you have to do that you don’t enjoy and it is so time-consuming that other aspects of your life will be neglected. So be sure that you really want to do it. Differentiation and clarity of communication are important but, after a certain point, your time is much better spent getting on and doing than worrying about the competition. Starting a business is a steep learning curve but there are lots of inexpensive training packages that are worth doing to help you on the way (starting with our’s of course!) Courses can be great networking also. My Granny always used to say “watch the pennies and the pounds will take care of themselves“. In a small business it is so true. Keeping your overheads down can make the difference between business life and death. And however much you hate doing the finances you mustn’t let them get out of hand – “a stitch in time etc” being another great saying of Granny’s! The most difficult bit is that first hurdle. But don’t worry, having your own business takes you into a new world full of like-minded people who understand why and how you got yourself there and are happy to help and share their own knowledge and experiences. What are you waiting for?! If you have an idea for a business, are maybe considering returning to work after raising your family*, have just got started and would like to build your skills or are considering a career change you may find our “how to start-up your creative business” useful. Find out more. *If you can run a household, keep it to budget, look after your kids and probably look after a few others around you also you have just been on the most amazing training course for running a business so watch out world! PS If you would like to buy some fabulously on trend upcycled fashion clothing please contact Annabelle, Ellie and Becky here! Great tips and help above to anyone thinking about starting their own business. Would highly recommend the “How to start-up your creative buisness” A fab day filled with so much information to help you along and share your experience with others in the same positions. Some friends & I are starting a new venture together and are just about to ‘Jump’, so thanks Debbie for the great tips. It’s so hard to keep focussed with everything there is to consider when starting up! Thankyou for asking me to comment about your latest blog. As you know I am starting a new business and almost there (hope to be up and running by end of July) so your blog is very timely. I have lots to say about the journey I have had and I will e-mail you later with my reply if that’s ok. And by all means you are welcome to publish parts or all of it as you see fit if you think it’s valid . Great tips…but I would add…don’t be afraid to ask for help, utilise your friends and family and indeed most people you talk to about your business are only too happy to help! That is such a great tip Phillipa. Thanks for adding it!